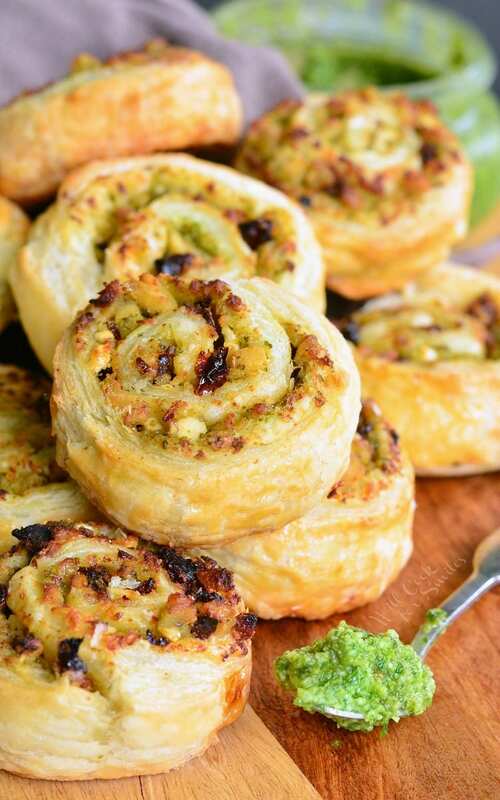 These Pesto Chicken Pinwheels would be perfect for football parties or simply as an after-school snack. 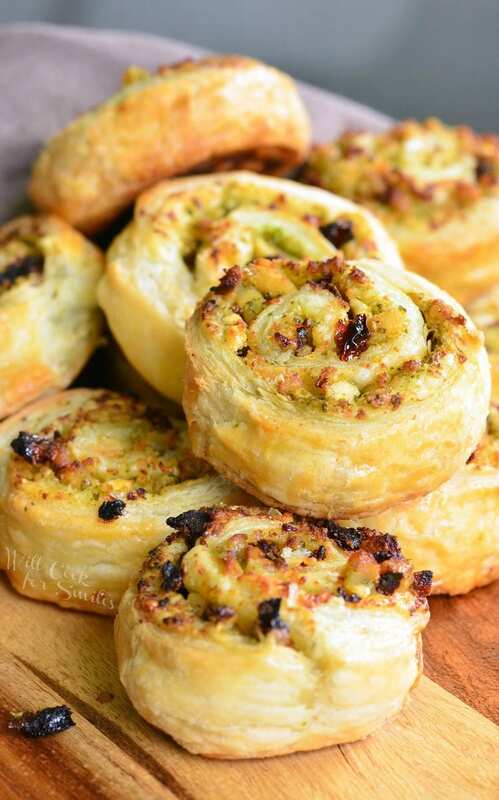 Flaky pastry, juicy chicken, fresh pesto, sun dried tomatoes, and feta cheese… All these tasty ingredients are rolled together to create a snack to delight your taste buds. When you have basil that is SUPER eager to grow, it might cause a “basil overload” problem. I’m kidding, of course! 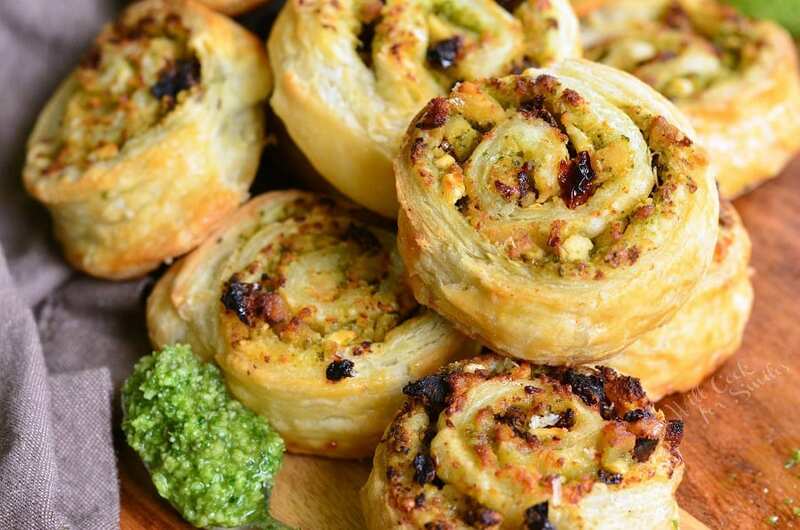 It’s only a problem if you don’t like basil or pesto. (Then again, if you don’t like it, you probably wouldn’t even be growing basil.) Well, lucky for me, I love basil and my family LOVES pesto. I’ve been waiting the whole summer for my basil to pick up pace and give me a fruitful harvest. Finally, in August, it picked up on my hints and started growing every which way. “Yay” for pesto. Just last week, I’ve made us some Pesto Chicken Stuffed Shells and Pesto Alfredo Tortellini for dinner. 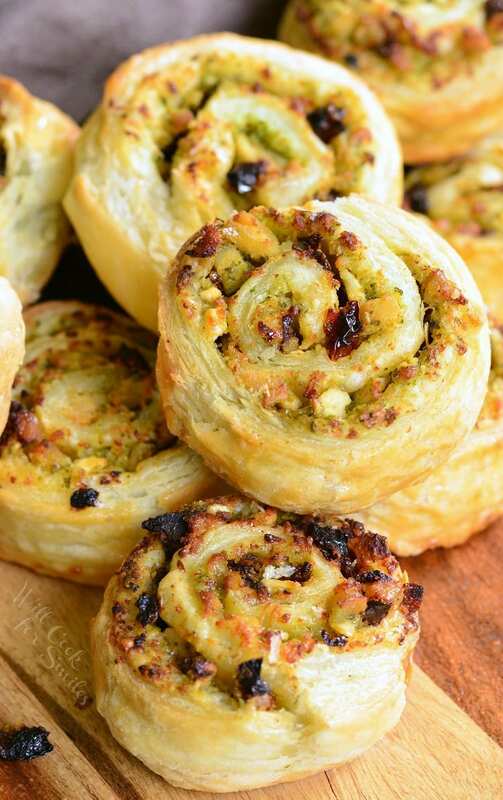 And, this weekend, I made these fantastic Pesto Chicken Pinwheels and packed them with sun dried tomatoes and feta cheese. 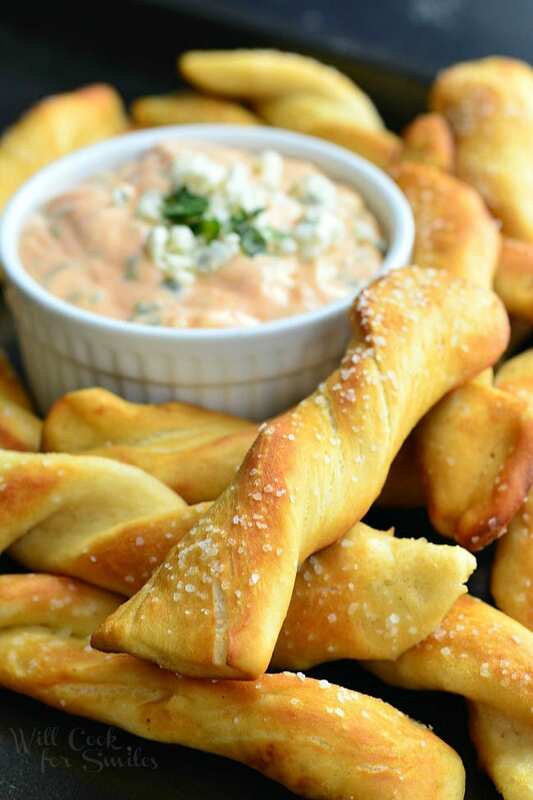 It was a perfect snack for the first football Sunday. 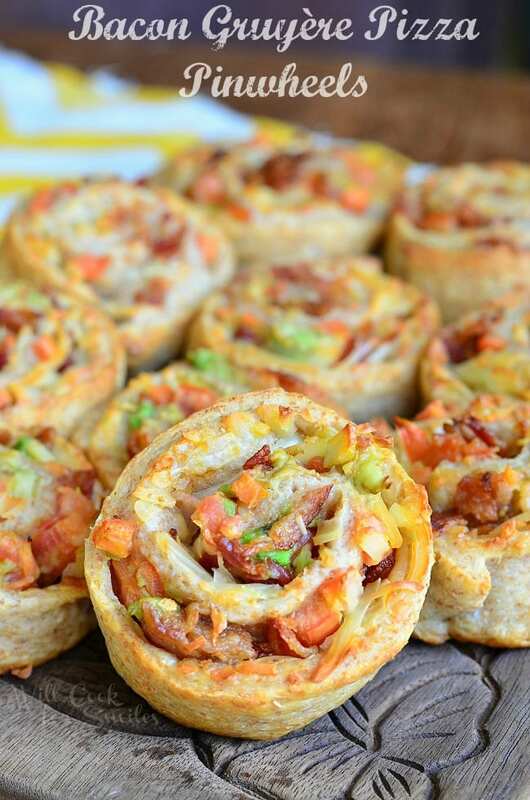 Oh my goodness, these delectable pinwheels look absolutely scrumptious! I adore chicken and pesto, so this is showing up this weekend for the latest football game! 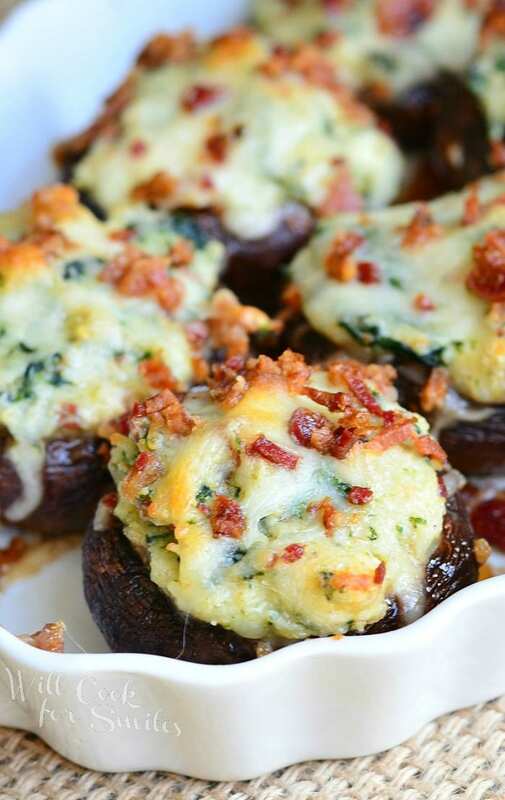 Printing this recipe! Great as a “grab and go” meal. Thanks!